FREE: Argentina Alphabetical Listing - More than 500 wines were reviewed for this report. A free alphabetical list is available. 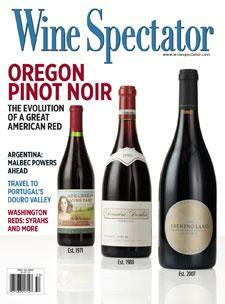 WineSpectator.com members can access complete reviews for all the wines tasted using the online Wine Ratings Search. WineSpectator.com: BONUS VIDEO: High-Altitude Malbec. Temperature changes with the altitude of the vineyard. Learn why this is important and how this impacts the wine in your glass, as Nicolás and Laura Catena taste a pair of Malbecs from Mendoza with Nathan Wesley. FREE: Washington Alphabetical Listing - More than 700 wines were reviewed for this report. A free alphabetical list is available. WineSpectator.com members can access complete reviews for all the wines tasted using the online Wine Ratings Search. Court Dismisses Collector's Suit On "Jefferson Bordeaux"
Matt Jennings’ Shellfish and Squash Stew With a Spanish White - Chef Matt Jennings, La Laiterie, Providence, R.I.
TWO WEEKS’ FREE ACCESS TO WINESPECTATOR.COM! Haven’t yet joined WineSpectator.com? From Nov. 14 to 27, we’ll be offering all visitors free access to our website’s members-only features. The period kicks off with the unveiling of our Top 10 wines of 2012, followed by this year’s complete Top 100 list. Keep coming back to check out more resources—our latest wine reviews, value picks, wine-friendly recipes and much more. Don’t miss this exciting opportunity! HOLIDAY RECIPES AND WINE PICKS Need new ideas for your festivities? How about great value wines and recipes to please a party crowd? We’ve got you covered with our series of holiday entertaining features. How We Taste: Take a behind-the-scenes tour of Wine Spectator’s tasting department to find out how we review nearly 20,000 wines each year in blind tastings. The Roots of Burgundy: The name Jacques Lardière is synonymous with great Burgundy. After 42 vintages with Maison Louis Jadot, the winemaker is retiring. He reflects on a lifetime of making wine from more than 130 appellations. NEW! ADD YOUR OWN RATINGS If you’ve been using our Personal Wine List to track your wine collection or record your tasting notes, now you can also rate the wines you’ve tasted, so it’s easy to remember your favorites. Or you can hand out star reviews as you look up wines up in our Wine Ratings search. All rated wines will automatically be saved to a convenient My Wine Ratings list for future reference. NEW, IMPROVED WINE SEARCH Find wines faster with our new auto-complete options. Our database now contains more than 273,000 reviews! As you type, our system matches the text against the most-searched-for wineries, wines and vintages; when you see what you want, just click and get your results instantly. WINE CLASSES Get more enjoyment out of the wines you drink with Wine Spectator School’s 10 online courses—all free with your WineSpectator.com membership. Learn what to look for in a glass of wine with ABCs of Wine Tasting, develop a deeper appreciation with Understanding Wine, or take a seminar on Wine and Food Pairing. Plus, the courses make great holiday gifts, and you can share the step-by-step tastings with family and friends.